Coupled with green farming practices and energy conservation, individual farms can reduce their environmental footprint by supplementing their energy needs with renewable sources. Green energy potentials such as biomass, geothermal, hydroelectric, solar, and wind power aren’t only cost effective on the long run, but they help slow down (much disputed) global warming. With some smart investment and planning, you can cut back your farm’s dependence on fossil fuels. According to the U.K. Department for Business, Energy & Industrial Strategy’s Digest of UK Energy Statistics report from 2017, the percentage share of biomass used for electric energy has almost doubled from 2014 to 2016. Plant and animal derived materials can be refined into biofuel for vehicles or burned to generate electricity or heat. While electricity production from biomass requires large scale and complex systems, individual farms can pelletize crops such as switch grass, corn, or fast growing trees and use them for heating building such as greenhouses. At the mention of geothermal energy, many people instantly think of hot springs and steam vents. However, there is an unassuming source of geothermal power much closer at hand and more easily accessible. Harnessing the constant ground temperature, farms can use geothermal heat pumps to exchange air temperature and ground temperature, making buildings warm in winter and cool in summer. These geothermal heat exchange systems are best suited for new construction projects since they involve extensive excavation. Although more expensive than fossil fuel systems, the investment pays off in 5 to 10 years. Provided there is a stable source of water with a constant flow, you can apply for a project and choose between several hydroelectric systems – waterwheel, impulse turbine or reaction turbine. Less efficient than turbines, waterwheels are best used for powering grinders and other machines requiring mechanical work. They are simple to use and especially suitable for inconsistent water flow ranges and handling water debris. Turbines, on the other hand, require water filtration, a more controlled and consistent flow rate and a greater head (the elevation difference between the water source and turbine blades). Any type of system is a long term investment, so make sure you choose the one that best suits your needs. Already in widespread use for greenhouse passive heating, aside from hot water systems, solar power can be converted to electricity. Although photovoltaic collectors (PVs) are the bigger investment, technical advancements are making them more affordable. On farms, PVs can be used for lighting, electric fencing, small motors, water pumps, ceiling fans or to charge vehicle batteries. However, when coupled with high-yield SMA inverters, you can have utility frequency alternating current that you can use for any AC-powered equipment. 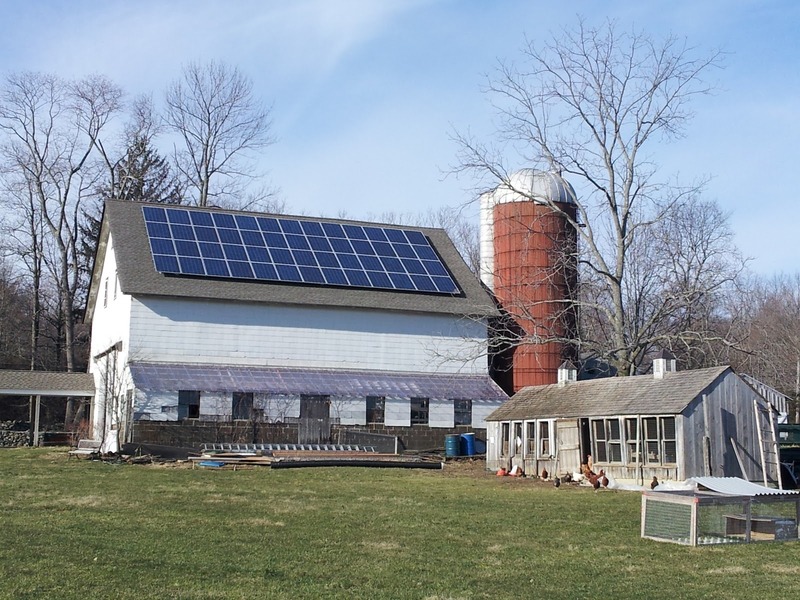 For an off-grid farm, a PV system with an inverter might be the only option. On the other side of the spectrum, a passive solar greenhouse design can be a cost-effective option for small growers looking to extend their growing season. In order to provide the average power needs of a farm, wind turbines need to be placed in high wind areas and may require at least one acre of land. This makes them especially interesting for farmers with grazing land in areas with high wind speeds. These stretches of land can even be leased to utility companies for energy generation, while still being used for farming. There’s even been research on how wind turbines may actually benefit crops planted underneath. In temperate climates, wind turbines are an excellent complement to photovoltaic systems, as wind energy is often available when solar energy is not. When considering renewable energy systems such as hydroelectric powerhouse, solar collectors or wind turbines, make sure you check with local zoning ordinances before the work begins. Also, depending on where you live, the local utility company may offer compensation for the energy you deliver to the grid.